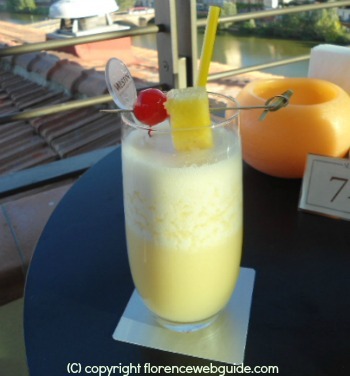 Aperitivi in Florence - the Cocktail Hour - is one of the most popular local traditions by far. A fantastic way to relax after a busy day of sightseeing, just sit back and unwind while enjoying a mixed drink and a scrumptious buffet. All you have to do is buy a drink and the buffet is included! You can eat all you like so some people even turn the aperitivi into a full dinner. Most cocktail hours in Florence start at 7 pm and go on til about 9. This tradition has become so widespread in town that nearly every bar offers some sort of aperitivi table....but some places are really special and particularly popular. 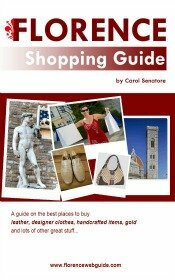 Find out the best places to go for aperitivi in Florence below! Flo is one of the trendiest spots to enjoy an aperitivo (trendy but NOT snobby, don't worry!). 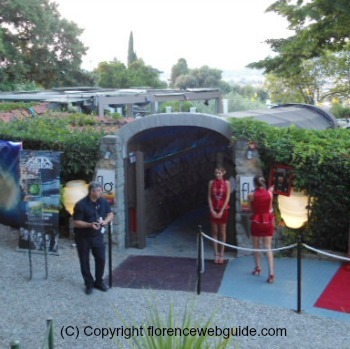 Located just off Piazzale Michelangelo, Flo is an open air locale so is a real summer favorite. 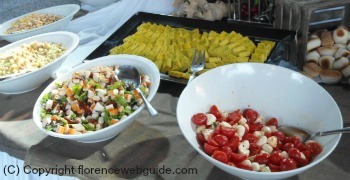 The cocktail hour buffet is exceptional: pasta salads, rice dishes, fresh fruits, cous-cous and veggies, finger sandwiches, and more! You won't go hungry here! What's more, you can really make a night of it if you want because at 11 pm, the place turns into a night club - disco lights and dance music....and your evening is set! TIP! 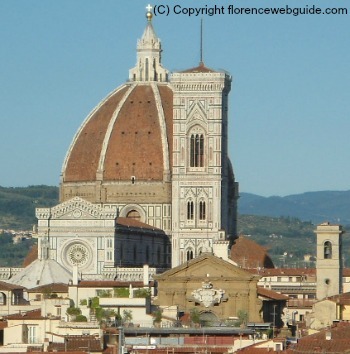 Flo is a VERY popular place for aperitivi in Florence so get there EARLY if you don't want to wait in line. Life doesn't get much better than this. Picture the scene: you're sitting at a roof-top terrace overlooking one of the most spectacular views on the planet, a breeze is coming off the Arno just below you, you're sipping a refreshing cocktail amidst the elegance and refinement of a 5 star deluxe hotel. 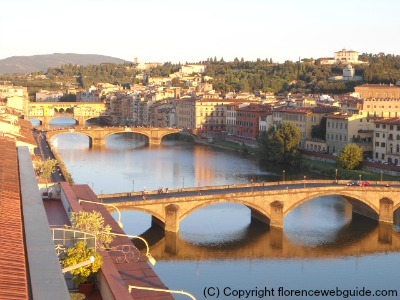 That's SESTO on ARNO, one of the city secrets for aperitivi in Florence! This unique setting comes with highly professional and friendly service as well as top-notch bartending with an extensive cocktail list. The buffet is more selective than other locales: a few pasta salads, mixed skewers, fruits plates, grilled vegetables and gourmet bread rolls. SESTO is also a restaurant, so for cocktail hour and true relaxation get there a little before 7 pm - from 8:30 onwards it starts to fill up and get busy. If you want to have your cocktail surrounded by Florentines at one of the city's most popular spots for 'aperitivi in Florence' then Easy Living is a great choice. 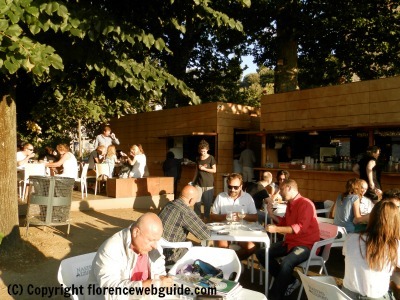 In Piazza G. Poggi (south bank of the river and right beneath Piazzale Michelangelo), this outdoor watering hole is in the square with plenty of shade from the trees (great for cooling off!). Open all day from 11 am onwards, the aperitivo however starts at about 7 pm (with the free buffet). Below the square's 'terrace' is a sandy beach that opens during the summer months. Relax at the water's edge, lying on a lounge (there are beach umbrellas too!) 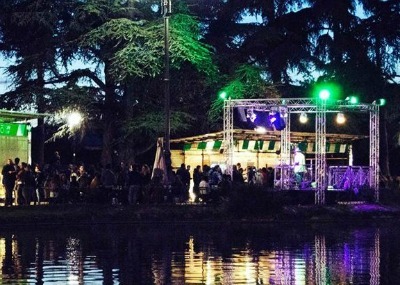 while musicians put on a free live concert, when the sun starts to go down, it'll be aperitivo time! Another hot spot for aperitivi in Florence is OFF-bar, an open air locale for cocktail time. OFF-bar is right next to the fountain and pond of the Fortezza da Basso plaza and garden, a favorite place for Florentines to hang out all year long, but especially in summer. When it gets dark the live music starts, usually funky or jazz tunes with concert-like lighting for effect.